Many new stablecoins have surfaced recently because, despite its name, they continue to have problems with volatility and reliability. There were 57 identifiable stablecoin projects and 23 lives ones. However, Blockchain Luxemburg SA reports that Tether accounts for the majority of the trading volume of stablecoins. It is safe to say that Tether dominates the stablecoin market. Blockchain Luxemburg SA published a report, titled “The State of Stablecoins”, that estimates that Tether is involved in 98 percent of the trading volume for stablecoins and 60 percent of daily trading volume for Bitcoin. It also stated that Tether holds nearly 93 percent of the market capitalization for all stablecoins, at around $3 billion at the time of writing. Furthermore, Tether is listed on the highest number of exchanges. Out of the 50 exchanges that list stablecoins, 46 of them list Tether. Some of the notable exchanges that list Tether include Binance, OKEx, Huobi, HitBTC, Poloniex, and Kraken. There was also a lot of other interesting information about stablecoins in general as well. 77 percent of the stablecoins are asset backed, and USD is predictably the most dominant peg. Approximately 60 percent of the stablecoins are or were connected to the Ethereum platform. 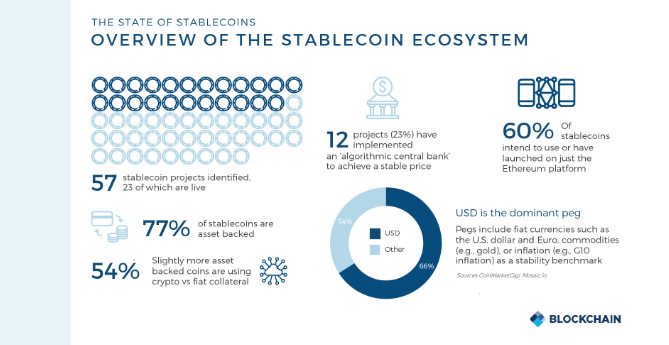 Stablecoins aim to provide a stable foundational layer for cryptoassets but their capability has mostly been surrounded by question marks. Tether has faced a lot of controversy regarding its validity, but, as seen by the report, monopolizes the stablecoin market thus far. Do you believe that Tether is a legitimate currency?